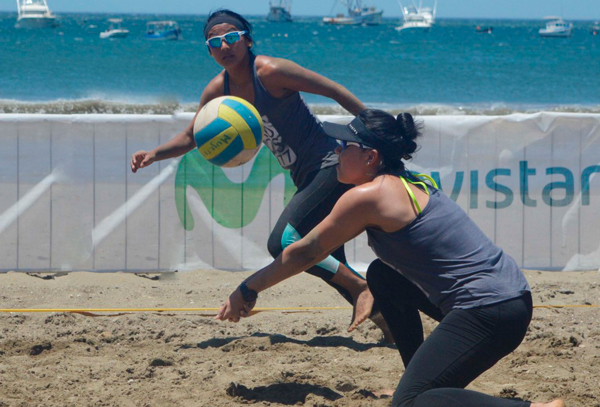 SAN JUAN DEL SUR, Nicaragua, March 19, 2019 – Denis López and Gerson Contreras in the men’s division and Elia Machado and Socorro Lopez in the women’s competition won the third festival of the Nicaraguan Beach Volleyball National Tour on Sunday. Lopez/Contreras put an end to the perfect march of Danny Lopez and Ruben Mora, winners of the first two stages, winning the men’s final 22-20, 20-13. López/Contreras won their pool undefeated and then dispatched Luis Duarte and Lenny Gómez 21-12 in quarterfinals and Miguel Lopez and Hernan Jimenez 21-11, 21-16 in semifinals. López/Mora won their three pool matches, then defeated Byron González and Mario Guevara 21-10 in quarterfinals and Jefferson Cascante and Francisco Dinarte 21-18, 21-19 in semifinals. Cascante/Dinarte won the bronze medal with a 21-11, 21-15 victory over López/Jiménez. After three stages, Mora/López lead the standings with 580 points followed by López/Contreras with 540 and López/Jimenez with 460. In the women’s event, Machado/López defeated Rodríguez/Mendoza 21-12, 21-15 for their second crown. Machado/López had lost to Rodriguez/Mendoza 21-16 in the six-team round robin. They also lost to Alonso/Lugo but advanced as one of the top four teams. In semifinals, Rodríguez/Mendoza defeated Cortez/Juárez in three sets 16-21, 21-10 y 21-9, while López/Machado beat Lugo/Alonso 21-18 y 21-12. Lugo/Alonso won 22-20 over Cortez/Juárez for the third place. Rodríguez/Mendoza lead the female event with 560 points, followed by Machado/López with 540 and Lugo/Alonso with 500.